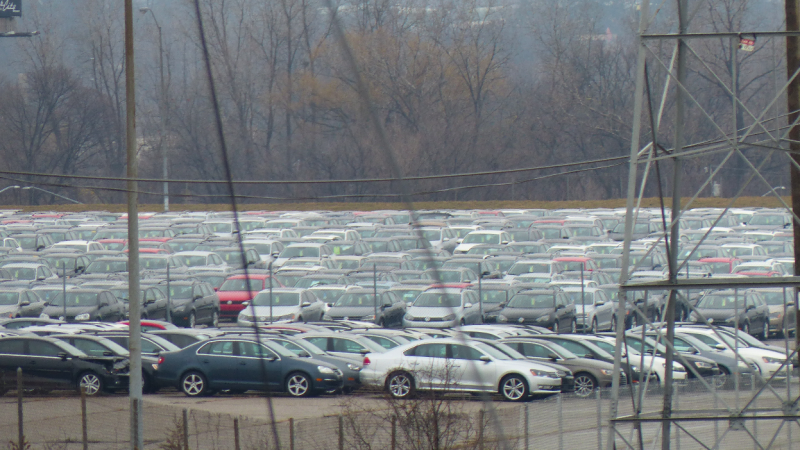 Thousands of cheating VWs have been stored in the former Detroit Lions stadium parking lot in Pontiac, Michigan since at least January. Last week, Louisville-based news site WDRB learned that over 60 of those cars have been reported missing, and many have already been found in Indiana and Kentucky with fraudulent titles. Some have even been sold. Volkswagen has recalled over half a million cars that cheated on emissions tests. Many of those vehicles, sold back to VW as part of a major class action settlement, are now property of the German automaker. VW can sell them once they have them fixed, but until then, the cars remain in purgatory, where they’ve been for many months. Unfortunately for VW, keeping such a huge quantity of cars accounted for, organized and safe isn’t easy. And now, WDRB quotes an Indiana police spokesperson as saying over 60 cars from that former Detroit Lions parking lot have been reported missing. The news site says that many of those 60 cars have been tied to a car dealership based out of Radcliff, Kentucky (the dealership claims it didn’t know the cars were stolen when it bought them from a Michigan supplier). That dealer allegedly brought the cars to the auction house in Indiana, where at least 15 TDIs were sold with fake Michigan titles to unsuspecting buyers. Volkswagen was keeping track of all these vehicles they were purchasing back or buying back...When these VIN numbers starting showing up again in their system, that’s when the red flags started flying up. But not all of the missing VWs were sold at the Indiana auction. Twelve were still at the auction house as of Monday, and VW was on its way to pick them up that same day to take back to Michigan. In addition, WDRB reported that nine cars were seized last week right outside of the dealership in Radcliff. So now, police are working to track down the remaining cars that have been sold, and perhaps others that are unaccounted for. I’ve reached out to Indiana State Police to learn more about this situation—one that has somehow made the whole VW Dieselgate saga even more of a shitshow.